We believe Haitians stand ready to thrive. fueled by their own passion, hope, and pride. without dependency on foreign aid. We believe in the hope of Haiti and its people. Project Living Hope Exists to Empower Haitians to Build a Stronger Haiti. 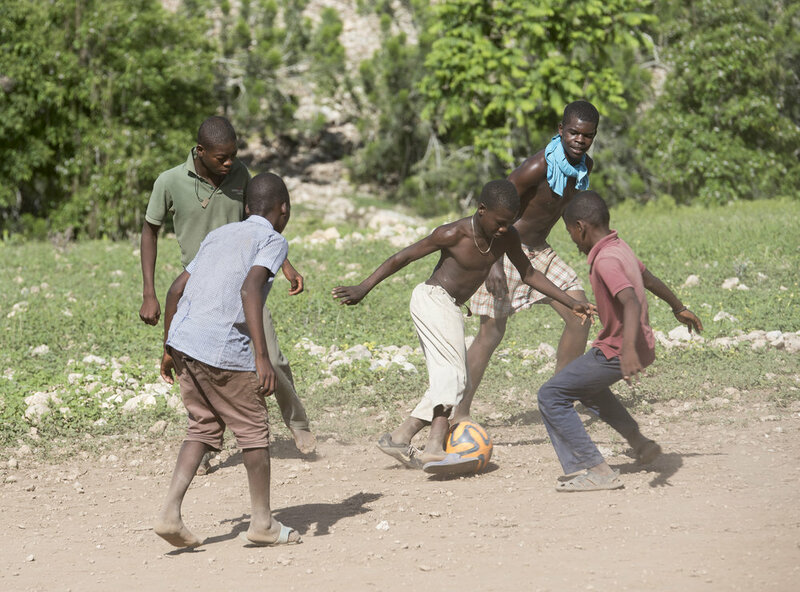 We are striving toward our goal of empowering Haitians by building The King Center, our vision for a multipurpose complex that meets many distinct needs in Haiti, including providing education, mentorship, and support through sports and job skill training, equipping for disaster preparedness, and becoming a centerpiece for the community. Training young athletes to overcome lack of self worth that results from poverty through purposeful mentorship and leadership development. Teaching Haitians job skills needed to be freed from the strain of poverty, and the cycle of dependency. Promote community development by providing a space (the King Center) for conferences, seminars, revivals, sporting events and disaster relief. The founder and president of Project Living Hope, Guesly Dessieux, was born in northern Haiti and immigrated with his family to the United States as a young boy. Nineteen years later, following his graduation from medical school, he returned to Haiti for the first time as part of a medical mission team. The team served for one week at Haitian Christian Mission (HCM) in Fonds Parisien, Haiti. Since that time Guesly has taken at least a dozen trips back to Haiti and has become increasingly involved with the work of HCM. Guesly's wife Sara was already serving with HCM in Haiti before the two of them even met. Both of them are passionate about doing whatever they can to help improve the lives of people in Haiti and share Christ's love for them in the process. The ambition of Project Living Hope is to construct a building, the King Center, that we believe will make a real and lasting difference for the people in and around Fonds Parisien, Haiti. We are currently looking for individuals, churches, and businesses interested in making a three-year pledge to help us build the King Center in Haiti. Please visit our Donate Page to to make a one-time gift or set up recurring donations. You can also help by sharing about the King Center with your friends, family, coworkers, and church. If you are interested in volunteering with this project, let us know! Currently we can use the advice and assistance from architects, structural engineers, HVAC experts, CAD and GIS designers as well as experts in managing construction projects in third world countries. Once construction is underway, we will need people with specific construction skills to come and work alongside Haitian workers, not only to build the complex but to also teach their skills. One of our ambitions is that the Haitian men who work alongside us will be able to take the skills and experience they gain to build a better life for themselves, their family and the community. If you are interested in traveling to Haiti to build with us or in helping in any way, please let us know! Once the King Center is built, we hope to recruit volunteer instructors in all kinds of trades and professions to teach seminars there. Guesly was born in Cap-Haitien, Haiti and when he was eight years old his whole family immigrated to the United States in hope of a better future. Even as a child, he dreamed of one day becoming a doctor so that he could answer God's calling to serve in the mission field. He attended medical school in Kansas City, Missouri and completed his residency in Jefferson City, Missouri. He now practices family medicine in Stayton, Oregon and leads medical mission trips to Haiti and other countries a couple times a year. Tyler has been pastoring in the Northwest for the past 13 years, the last 8 at Foothills Church in Stayton, OR. His heart for God’s work outside of the US has taken him to Central America, Southeast Asia and Mexico. The past few years God has been stirring in his heart a passion for the people in Haiti. Still waiting for his first experience in country he’s had a small hand in strengthening partnerships between his church and community with efforts in church planting, educational and medical efforts in Haiti. Also, Tyler and his wife have been approved to adopt two children from Haiti to add to their three biological children. He’s excited to be working with PLH to bring the gospel to Haiti while meeting the tangible needs of the people. Sarah first traveled to Haiti in 2009 on her honeymoon, just after she married Ben Comstock. Both Sarah and Ben knew they wanted to work in short-term missions in Haiti. Only 6 months after they were married, Ben and Sarah adopted their son Droiy from Haiti in 2010, right after the earthquake. A couple years later, they moved to Sublimity, Oregon, where Ben is an elementary school teacher in Sublimity. Sarah is a biology professor at Corban University in Salem. Sarah helps lead a team of pre-medical students from Corban to work alongside medical providers in Haiti every spring with Guesly Dessieux and Debbie Turrell. The Comstocks hope to return to Haiti regularly, as a family, to work in a humanitarian capacity. Pierre was born in Haiti and moved to the U.S. when he was fourteen years old. He went on to earn a bachelor's degree in Human Biology and a master's degree in Business Administration. Pierre now works with Great Plains Labs. After having been away for 19 years, his first trip back to Haiti was immediately after the devastating earthquake in 2010. As one of the son's of the country, his return was very painful. It was hard for him to see the conditions, misery and pain of his people. His roots run deep in the Haitian community so he is glad that Project Living Hope will grant him the opportunity to serve as an ambassador for his people. He and his family live in Lenexa, Kansas. Lesly was born in Cap-Haitien, Haiti but immigrated to the United States when he was eight years old. He attended medical school in Kansas City, Missouri and completed his residency in Jefferson City, Missouri. Now he practices family medicine near Houston, Texas where he lives with his wife and two children. Lesly has been back to Haiti several times with medical mission teams and is glad to be joining an organization that he believes will empower the population it serves through Christ. Sara first traveled to Haiti in 2001 to serve at Haitian Christian Mission (HCM). She loved it there and so went on to spend about two years living in Port-au-Prince working with HCM's child sponsorship program and translation school. She met her husband, Guesly, at HCM when he came with a medical team. They now live in Stayton, Oregon and she stays home with their three young children. She still works with HCM on a voluntary basis sending out email newsletters and assisting with other letters and publications. Jerry has been to Haiti twice with his wife Claire on Medical missions with Dr Dessieux. There he saw the physical devastation caused by the earthquake as well as the spiritual/social conditions that limit the opportunities for the Haitians. He has a heart to help the people of Haiti and other places in the world find Jesus and have the resources not only to survive but to thrive on their own. Jerry is an engineer specializing in electronic, electrical, and mechanical systems. He is also a builder with experience in residential and commercial construction and project management. Collin is the Executive Director of Capital FC Timbers, a non-profit youth soccer club in Salem, Oregon. Collin met Guesly through soccer, and has been to Haiti two times to provide coach education and training to Haitian coaches. He is passionate about making an impact in people's lives through sport and believes in the power of sport to reach communities with the hope of the gospel.